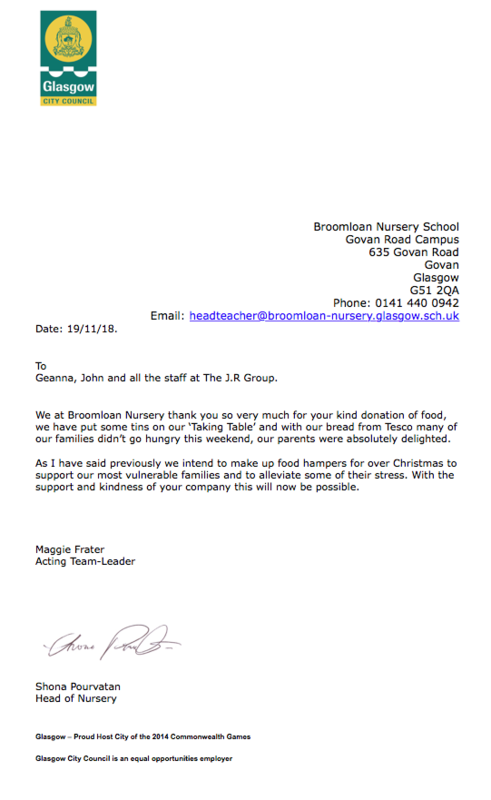 The JR Group were delighted to be involved in assisting Broomloan Nursery with their essential charity work over the festivities. As we approach December it is an important time of year to reflect on the year gone by and also plan for the month ahead, making a conscious effort to help those most in need. The team at The JR Group have been working with Broomloan Nursery, gathering food and supplies to donate to their cause. Food hampers will be provided over the Christmas period in order to support their most vulnerable families. Pictured above (right): Managing Director, John Horne dropping off donations to the foodbank. Along with some toys and books donated, we are just happy to play a small part in the great work they do for local families. We encourage everyone to give what they can to such a worthwhile cause and help alleviate some of the stresses many vulnerable families feel at this time of year.